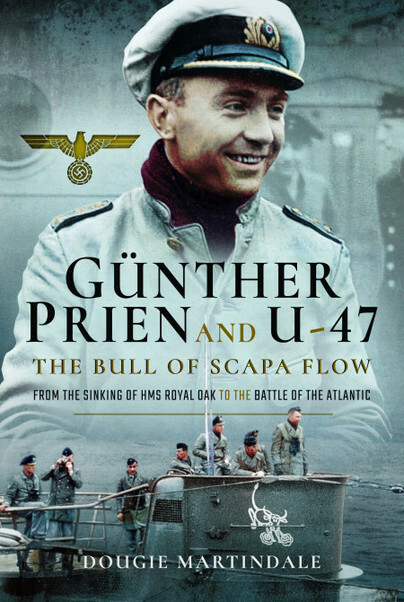 You'll be £25.00 closer to your next £10.00 credit when you purchase Günther Prien and U-47: The Bull of Scapa Flow. What's this? On the night of 13/14 October 1939, the Type VIIB U-boat U-47, on its second War Patrol, penetrated the main Royal Navy base at Scapa Flow and sank the British battleship HMS Royal Oak. This legendary attack is remembered as one of the most audacious raids in the history of submarine warfare. Laid down on 25 February 1937, and entering service in December 1938 under the command of Oberleutnant zur See, later Kapitänleutnant Günther Prien, after sinking HMS Royal Oak both Prien and his famous U-boat were known thereafter as ‘The Bull of Scapa Flow’. During a lavish celebration in Berlin to mark the sinking of HMS Royal Oak, the crew members of U-47 were received by Adolf Hitler. For his part, Prien received the Knight’s Cross, becoming the first U-boat officer and only the second member of the Kriegsmarine to receive this decoration. Still under Prien’s command, U-47 returned to sea on 16 November 1939. Over the months that followed, U-47 went on to complete a total of ten war patrols. During these, Prien and his crew sank a total of thirty-one Allied ships and damaged eight more, making it one of the most successful U-boats of the Second World War. As a central figure in the Battle of the Atlantic, Prien was consistently at the heart of events until he was lost on board U-47 in March 1941. U-47 had departed Lorient on her tenth and last patrol on 20 February 1941. She went missing on 7 March 1941. In this remarkably detailed account, the author charts the full story of U-47, its commander and crew. As well as examining all the main events in each of U-47’s ten War Patrols, particularly the attack on HMS Royal Oak, for which a number of important new conclusions are explored, as is U-47’s final fate. DOUGIE MARTINDALE is the author of fifteen articles which primarily focus on the modifications made to German U-boats and the paint colours. Ten articles have been translated into Spanish and six were published in the SubCommittee Report magazine. He is co-owner of Accurate Model Parts, a company producing aftermarket products for submarine models. He has also completed books on Scottish aircraft wrecks and cycle touring. Dougie lives in the west of Scotland with his wife and daughter.